austrianalpine.com: May & June Training, Nutrition, etc. My training in May and June centered around gaining strength. A short term negative side effect of strength training is weight gain. This comes through muscle hypertrophy and some extra body fat. towards the end of June I have concentrated on getting my overall weight back down, and hopefully retaining the increased muscle that I built up in the last six weeks. In April, I calculated my lean body mass at 64 kg. 2 months ago, with about 10% body fat, my weight was between 70.5 kg. and 72 kg. At the beginning of June I had increased my weight to almost 74 kg. but my body fat did not go above 11.3%. The math than indicates that during my strength phase my lean body mass increased to about 65.5 kg., which means an increase of 1.5 kg. in muscle gain. That sounds all well and good, but for all practical purposes that extra 1.5 kg. was simply what I call "dumb muscle". In other words the newly gained muscle had to be converted into usable strength in all types of climbing applications. The goal in body composition for climbing is the highest degree of strength at the lowest weight. Additionally, you want to be able to recruit the highest possible percentage of muscle fibers when you exert force. So to paraphrase a cliche, quality of muscle over quantity. In May and June I had around 80 hours of training each month with over 30 training sessions. I averaged 3,000 meters of elevation gain per week in my endurance training. I did a lot of supplemental strength workouts paired with basic endurance climbing. Along the way, I had a few days were I could test my fitness and effects of my training and diet. First, my diet: I have been eating a lot of protein to gain the extra muscle. Secondly, I have been trying to condition my body to burn fat stores for energy. I eat very little carbohydrates, and the carbohydrates that I do eat are complex carbs made up of mostly leafy green vegetables, nuts and seeds. I do not eat grains or simple sugar. I have almost stopped eating fruit to limit fructose as well. I have been doing a lot of training in a fasted state, trying to force my body to burn fat stores to fuel the exercise. I have also restricted the amount of water that I drink during training The purpose of these two practices is to physically and mentally adapt to functioning in a depleted state. 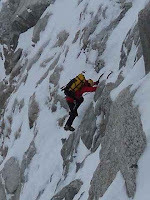 On long alpine outings, you can not possibly carry enough calories or always be well hydrated because of the weight of the food and water, or the time it would take to melt snow or cook. I had a few different "test" days to evaluate how things were progressing. The following are a few examples across a broad spectrum. Basic alpine endurance was tested by climbing the Hochkalter (2600+m) over the Blaueis glacier route with a moderately heavy pack and doing "sprint" intervals at the upper part of the glacier where it steepens to 50 degrees. I did 1900 meters of elevation gain in four hours and completed the descent to finish the training in under seven hours. I did trail runs at a pace of 850 to 1000 meters of elevation gain per hour. I did the standard hiking route to the top of the Höher Göll (2500+m), doing about 1500 meters of elevation gain (over a long distance) in 2.5 hours in a fasted state without food or water - though I had a real dropping spell on the descent and had to back off the pace. Lastly, I was able to do a classic alpine rock climb with my friend Alex in the Reiter Alpe (Berchtesgadener Alps). We did the Direct South Ridge on the Mühlsturzhorn (Hinterstoißer/Kurz, VIII-, VI+/A0, 350m) including a long approach with 1000 meters of elevation gain. I did the 11 hour outing in a fasted state with just drinking about a liter of water during a very hot day. I had one spell of mental tiredness during the climbing, but overall felt really good and strong all the way through the descent. Other small indications that I am on the right track with training and nutrition are the overall strength increases in pull ups, presses and fingerboard holds. What has really shown improvement is my ability to generate power in climbing and running/hiking. I feel a lot more dynamic while climbing and feel a "springiness" in my legs. I could on-sight my first 7a in the gym about a week ago. I have been able to climb 450 to 500 meters in the climbing gym on endurance days. I am in a phase of power endurance training in which I do climbing sets of up to 8 route laps without rest. I have been able to push this up to 6c+. I still have not reached my body composition goals with a standard weight of 68 kg.. (going down to 66kg. for hard sport climbing) and a body fat percentage of 6-7%. I am now at about 70 kg. and 9-10% body fat, with my plans to reduce this further during my six-week stay in Kalymnos as I train hard sport climbing and off-day trail running. I feel that I am primed to make some major advances in my sport climbing grades. What is most encouraging to me is that I still can improve a number of elements of my training and nutrition, which will produce further benefits. I always think there are ways of tweaking, balancing and adapting that bring about new physical and mental stresses that cause further gains. I feel there are so many different elements in how I train, eat and live that I want to slowly adjust to get everything in harmony and working in a synergistic manner. I have always loved jazz guitarist Pat Metheny. In the 1980's, I first heard the Pat Metheny Group recordings. There is a song of his on the American Garage album called, "The Search". The tune fits into the fabric of the album as a part of the concept of the musical energy of young, idealistic, garage bands in the American mid-west. The music is an aural metaphor of a basic philosophy of how to go through life. Always trying, experimenting, evaluating, being open minded, knowing that you are fallible, and fully embracing change and evolution. Because once one starts behaving in a way of repeating the same things, trying to repeat the past and fearing change, then training as well as life rots away, becoming boring, depressing and full of frustration.